Requested compact layout as an alternative to the compact SHO. This is not an improvement on the SHO because even on the minimum setting the amount of boost is too much for some people, even for me, and I play LOUD. Of course if the purpose is to punish an amp and everybody in the room then okay. But for just doing a simple boost in a dense mix of musical instruments on a rehearsal or live, it will be to loud, even with the pot on it's start position. Just so you guys know. That being said, it sounds great to me. But nothing is quite like a SHO with a Zetex brand BS170. It may be worth expanding on it to get the best of both worlds, separate the source from ground and add an additional 5K reverse log gain control. Then you can use the new pot to alter the gain of the stage, and the original 1M pot to alter the signal level going into the stage. Personally the crackle never bothered me anyway, I've never altered the level in the middle of a song. About the 1n5242B. I looked at the datasheet for a 1n5817 and it looks like it will handle (even overkill) the work. Can I use the 5817 or is there a better sub for the 5242 12v'r? I was just about to say the same thing. That diode is basically there to protect the MOSFET, so any diode should work. I have no clue if it will, or how it will, affect the operation of BS170. That little detail got by me totally! I guess that's like the difference between a weeping willow and a pine....both are trees but very unsimilar! I don't have bs170 or 1n5242...can you you suggest sub's for these?? The 2N7000 will work in there (rotated 180 degrees), and any zener from 5 to 20V will work fine. I didn't realise this wasn't tagged as verified yet. Tag it, I've built and used 3 or four of them. I've got a few built lying around waiting to be used.. Awesome! 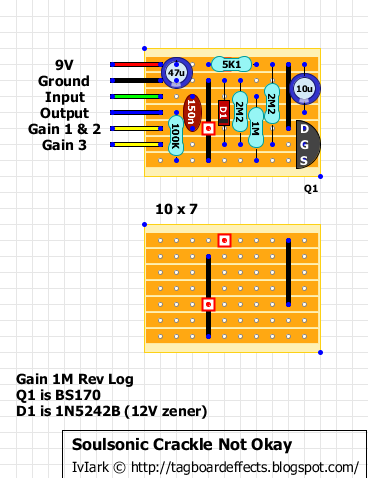 Did you use all of the components in the layout, or did you modify? Also, the first comment on here says that it is too much of a boost even on the lowest gain setting...Did you find this to be true? .... Good question, and sorry I haven't gotten back to you. I didn't think so. I've used it as a standalone (pre effect), as a post effect boost, and stacked with a treble booster. It's bloody loud though. Brian May Treble Booster into Crackle Not Ok. Makes a nice AC/DC style crunch. Crunchbox into the Crackle Not Ok. Great combo, a friend brought this off me after trying it out - he used it on a production of Rock of Ages. Hello guys, is this project considered as verified? as i see, Willy verified it, so yes. i guess admins have missed that but it happens! Yup. Has slipped by. Consider it tagged now.